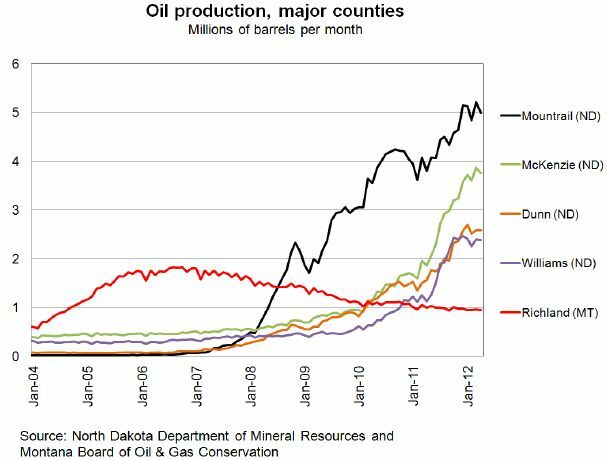 North Dakota surpassed Alaska this summer to become the 2nd largest oil-producing state in America, behind Texas. There are 1/3 more wells now producing 3/4 more oil than a year ago and over twice as much crude produced as two years ago. Most of those wells are in the Williston Basin’s Bakken Formation, a shale oil deposit reaching across western North Dakota and eastern Montana. Oil and natural gas production have boomed and busted their way across the American West for a century. The Bakken oil boom underway in North Dakota and Montana is no different… and much different, providing a gusher of information for planners and consultants at the Western Planner/West Central APA Chapter Conference in Billings this month. I’ve been watching development in the state where I grew up and decided to look into the situation a bit more. In 2008, the United States Geological Survey (USGS) released an assessment of undiscovered oil and natural gas resources in the Bakken Formation, estimating about 3.65 billion barrels of oil and over 1.85 trillion cubic feed of natural gas in reserve, not counting Canadian reserves north of the border. While oil was initially discovered in the Williston Basin in the 1920s, production ramped up in the 1950s, peaked in the late 1960s, then boomed in the 1980s. The bust that followed 1986 peak production hit communities across the region hard. Advances in production technology, in particular horizontal drilling and hydraulic fracturing (aka ‘fracking’), opened up new opportunities in the new millennium, first in the Elm Coulee Field of Richland County west of Sidney, Montana, and then the Nesson Anticline centered in Williams and McKenzie counties near Williston and Watford City, and the Parshall Field across Mountrail and Dunn counties. Throw in Sheridan and Roosevelt counties in Montana, Divide and Burke in North Dakota, and you’ve got a lot of wide open country impacted by oil and natural gas development. I’m not a geologist nor an energy expert, but the idea is the same: there are alot more rigs out there and a lot more oil coming out of the ground than a few months ago, and current production is already almost 4x the 1980s peak. That’s having an impact on people and their communities. Oil exploration and production is bringing change to western North Dakota and eastern Montana. An oil play brings impacts in two waves, first exploration and drilling new wells, then maintenance of wells over their productive lifetime. Drilling new wells requires a lot of people and equipment, and with fracking it requires water—a lot of water, between 3.0 and 3.5 million gallons per well in a very, very dry region. That water usually has to be trucked in, then the heavy, waxy oil produced has to be trucked out. The Federal Reserve Bank of Minneapolis expects drilling to continue in the Bakken for at least the next 10 to 20 years, with up to 20,000 new wells on tap in North Dakota alone. Each active rig involves about 120 workers; at least for the next 10 years, over 24,000 workers could be working on oil rig operations annually. Those 24,000 workers exceed the population of any of these counties but one, and then would require every man, woman and child living in Stark County (Dickinson) in 2010 to work in the oil fields. The Fed tracked a 50% increase in employment in the Bakken area since 2009, noting some significant anomalies in the data which I would expect given the highly mobile population reported to be coming in from out of the region to get this dirty, often dangerous work done. Average wages in the Bakken have risen both due to increases in wages themselves and shifts in the types of jobs held in the Bakken. Wage increases account for close to three quarters of the average wage increase during the oil boom, while the shift in employment to oil-related activity accounts for about one quarter of the average wage increase. Dickinson and Williston, North Dakota, are the two largest cities in the Bakken proper. While I know the economic developers in both places from my days at Traill County EDC, and met the first planner hired by the City of Dickinson at the Western Planner Conference, they’re a bit too busy to bother these days. New housing units tripled from 2009 to 2010 in Stark County, from about 100 to over 300. The City of Williston saw housing units explode from under 200 in 2009 to over 600 in 2010 and almost 1,400 in 2011. Impacts are being felt along US 2 (the “High Line”) and I-94, to the east in regional centers Minot and Bismarck, in North Dakota, and west as far as Billings, Montana. So you have new jobs and income coming into historically stable rural economies, and rapidly accelerating demands on infrastructure and social services from new workers and industries. As we say in North Dakota, “Ufdah!” Roads are clogged, service businesses can’t find entry-level labor, and law enforcement is stretched thin. Yet, in the spirit of the region’s most famous resident, President Theodore Roosevelt, there are also bound to be new opportunities opening every day to leverage short term oil and gas gains for long-term benefit. How far will the Bakken go? It’s not clear. The USGS is due to update their Bakken outlook soon. Consultants at the Western Planner conference are preparing for continuous drilling as technology improves and adjustments are made with new geological data. The Three Forks formation under the Bakken shows promise. 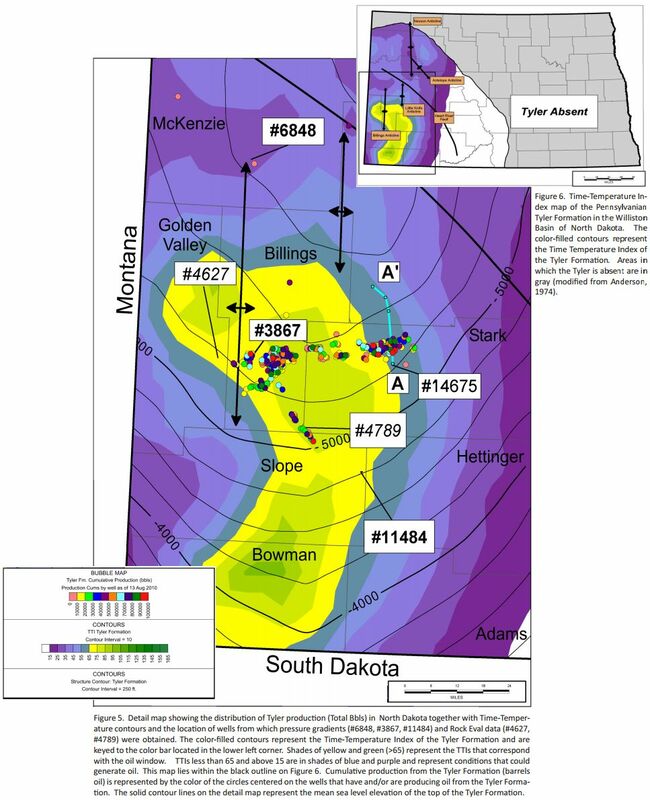 New reports also indicate a new play coming—the geologically younger Tyler Formation, related to the Minnelusa Formation in South Dakota and Wyoming. While not as big as the Bakken, the Tyler will extend production from Billings and Stark counties along I-94 across Slope and Bowman counties down US 85. Further west, the “Alberta Bakken” shale along the Rocky Mountain front has led to a flurry of exploratory activity centered on the Blackfeet Reservation, north of Great Falls, Montana. However long and however wide, we have some work to do. [ND] Department of Mineral Resources reports that 188 rigs were drilling last week. That’s the lowest level since August 2011, when 187 rigs were active. A record 218 rigs were drilling in western North Dakota’s oil patch in late May. This entry was posted in Economy, Policy and tagged Alberta, Bakken, infrastructure, jcshepard.com, LinkedIn, MT, natural gas, ND, oil, planning, SD, shale. Bookmark the permalink. Great write up! One interesting thing about July’s record production was that per-rig production was up almost 20% from last year, which is a good sign that companies are getting a lot more efficient. I think that’s where it’s going to be at if they’re going to make the Bakken work long term.